With some justification, in fairness. 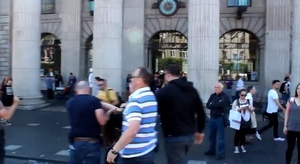 A pro-choice protestor at the pro-life rally yesterday is bundled away by plain-clothes officers having apparently been found in possession of little more than a ‘tude. Meanwhile, On O’Connell Street, Dublin ‘They’re Locking Themselves To the Rads, Joe’ Meanwhile, On Fitzwilliam Street Free At Lunchtime? Posted in Misc and tagged Pro-Choise, protest at 9:08 pm on July 7, 2013 by Broadsheet. Mickey Twopints on How Long?